Since MIS market information is collected by the DfE every term as part of the school census, in theory it's possible to request the data from them on a termly basis. However, I normally only bother doing analysis annually, using data from the autumn term. This is partly because schools have historically preferred to switch over the summer, meaning the termly data doesn't usually show big movements; and partly because people laugh at me if I spend too many evenings writing about education technology. And yet, after skimming through the May 2017 data (requested in an FOI by Richard Harley, founder of Scholarpack), I thought the numbers were interesting enough to whack up a quick blog post / Tableau viz of the data. I have also heard from reliable sources that Wauton Samuel (WS) is exiting the market, having come to an arrangement with Scholarpack for a large proportion of their schools to switch to them. Since WS had 115 schools at the last count, that'll inevitably boost the total 16-17 switching number further, so it looks like it will be a (relatively) busy year for the MIS market. Anyway, here's the data in a few tables and charts. My analysis is below. Nine companies now have over 100 school customers. This compares to just five in 2014, making the market more competitive than ever. I consider 100 schools to be something of a magic number - many MIS founders will tell you the first 100 are the hardest to come by, and it's also a level of market share that could conceivably sustain a small business, or at least give confidence to shareholders eager to see growth to justify their investment. Of course, the exit of WS will take this down to 8 come next year, but still, that's plenty enough options for schools to feel like they have good choices. 534 schools in England switched MIS between September 16 and May 17. That's a lot by historical standards. Unfortunately I don't keep tabs of the in-year numbers, so I can't give you accurate, like-for-like numbers for previous years, but I do know that 659 switched in the whole of 15-16, and I'd take an educated guess that the number has typically been lower than that in recent years. Given the Wauton Samuel news, I now think it's highly likely that we're on track for 700+ switchers in the academic year. Scholarpack are the big winners, followed by Arbor, Bromcom, Schoolpod and Pupil Asset. 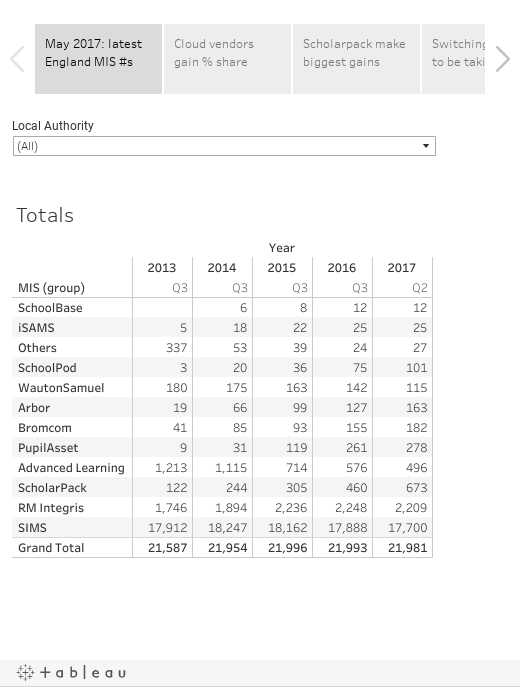 Scholarpack gained 213 schools net in the first two terms of the academic year, with net increases of 36 for Arbor, 27 for Bromcom, 26 for Schoolpod and 17 for Pupil Asset. These five companies have all shown significant year-on-year growth for the past five years now, and between them they represent 6.4% of the market. SIMS still has over 80% of the market. Just because others are doing well, it shouldn't be assumed that SIMS are struggling. Indeed, if you can retain an 80% market share in the face of increasing competition from those around you, you're doing something right. Advanced Learning (AL) may turning the corner. In the past six years the AL market share has dropped from 6% to 2.3%, and while there were further net losses this year, there are also more positive signs for the company behind both CMIS (locally hosted) and Progresso (cloud-based). The net loss of 80 schools over the two terms is likely to be weighted heavily towards CMIS (the two systems aren't separated out in the data), and the company will no doubt be encouraged by the 46 new school customers (presumably for Progresso). Stripping away those losses, after Scholarpack (214) and SIMS (125), AL actually ranked third overall in terms of number of new customer wins, which will please fans of a competitive market. Scholarpack say they are "built for primary schools". In other words, they aren't focussing on the secondary market. Arbor promote their data and analysis capabilities, pitching themselves as the system that will "integrate all your data in one place"
SchoolPod care about price-competitiveness so much that they say "if you can find a cheaper price, we will match it." A final observation: with Capita having announced revamped, cloud-based versions of SIMS for both primary and secondary in 2018, every vendor in the English market is publicly pinning their future on a cloud-based product. Perhaps unsurprisingly (given that I run Assembly, a cloud-based schools data platform), I think that's a good thing. The cloud offers flexibility and simplicity that should bring significant benefits and savings to schools. But not the full picture as it is only showing state schools. So some popular MIS are not shown at all.